Rusty’s story with my family begins a few years before we actually got him. My kids had, since they were fairly young, been on my case to get a pet, preferably a dog. I resisted, curmudgeon that I am, using the argument that it would be the parents, Patty and I, who would end up taking care of the pet, etc., etc. They were persistent though, and Amy went so far as to “adopt” in a manner of speaking, a Golden Retriever on the internet; she gave him a name (or maybe it had one – I forget), and asked often to get Sir (or some other dog) for real. Fast forward to about 9 years ago – when Heather came up and asked if we could adopt the dog of a friend of hers, whose family was moving to digs that could no accommodate the dog. Coincidentally, the dog was a Golden Retriever, named Rusty. And rather old already, about 8 years old. Well, needless to say, I relented (much to the kids’ surprise – never assume that Daddy isn’t really listening), we took in this 8 year old dog and began a wonderful relationship. Rusty took to the Hunts famously, and quickly became Patty’s shadow. He was a great host for the traditional lab New Years Day get together, and left many a youngster pleading with their parents to get a dog of their own. He was a wonderful and comforting companion, everything that Goldens are supposed to be. Except for one thing. Rusty lived a lot longer than we expected, living for more than 8 years after we took him in. 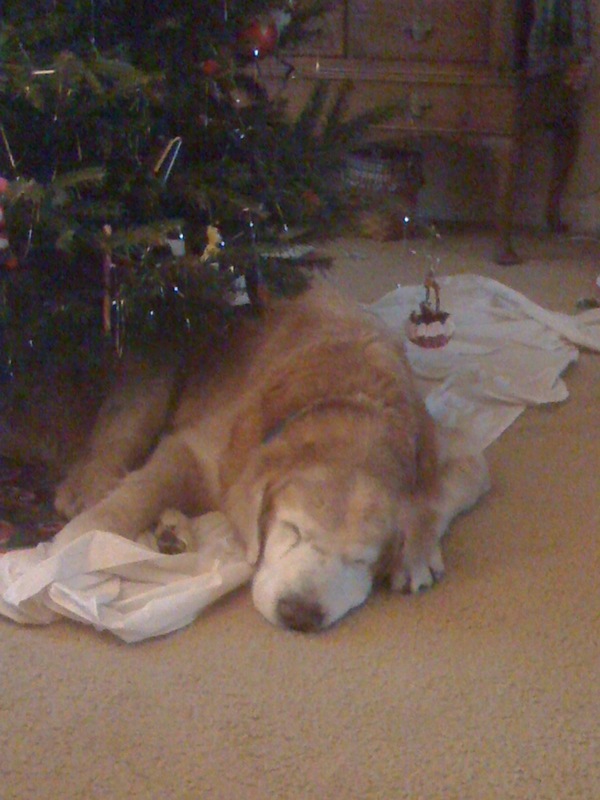 (I’m told a 16 year old Golden is pretty rare.) To be sure, he showed his age for the last few years, but was always full of a pleasant, even mischievous personality. With each passing year, as he turned 14, then 15, then 16, we counted our blessings and looked forward to each new day with Rusty. We had to say goodbye to Rusty on Monday. A week after Amy returned from PA, a week that we are all so grateful for, his old body finally gave out. The house is a bit emptier. This entry was posted on Tuesday, May 22nd, 2012 at 8:49 pm and is filed under About me. You can follow any responses to this entry through the RSS 2.0 feed. You can leave a response, or trackback from your own site. My condolences. Rusty put in a good run, and I am sure was a source of joy to you and your family. Monday was one of those days. I had an NSF deadline that day. Moreover, I was traveling to NC for a seminar. Which meant I was enroute when my kids, and then the vet, called. It’s hard to find a quiet spot in an airport to talk things through with family and reflect on what is going down…. Sorry to hear about Rusty, Art. Sherlock is approaching that stage of life, and it’s going to be tough.